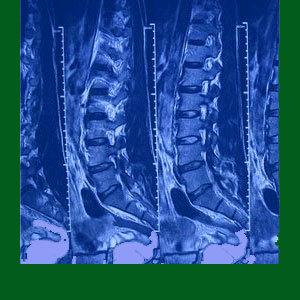 Spondylolisthesis MRI testing will not only show slipped vertebra, but will also help detail the neurological and soft tissue consequences of the condition. MRI evaluation remains the preeminent form of diagnostic imaging and is especially useful for spinal conditions that can create pain through several different mechanisms of action. However, there are also downsides of MRI testing that affect many patients. The test is certainly not perfect and can even be used against the patient when it is interpreted by greedy, money-motivated doctors with agendas towards expensive and often invasive treatment planned. This patient guide provides guidance on the use of magnetic resonance imaging for spondylolisthesis conditions. We will explore the positive aspects of MRI, as well as the potential downsides of evaluation using this innovative and expensive form of diagnostic medical imaging. MRI might be ordered as a preliminary diagnostic imaging tool, but is often recommended after x-rays have already confirmed the diagnosis of spondylolisthesis in one or more regions of the spine. Regardless, MRI evaluation is always superior, since it allows radiologists a chance to observe the collateral effects of listhesis instead of just the skeletal changes, since MRI can visualize soft tissues, the spinal cord and both the central and foraminal canals in vivid detail and from multiple perspectives. During the MRI, the patient must remain completely still for the time needed to complete the test, which generally ranges from 10 to 45 minutes, depending on the location and age of the machine. Closed MRI devices can be claustrophobic, but produce much better images than open styles that allow more flexible positioning. Once the test is complete, images will be easily transferable to disc or sent via any electronic medium for easy evaluation by several doctors. Usually, the images will be read first by a staff radiologist to highlight points of interest and abnormality. This primary reading should indicate structural aberration, but should not provide a diagnosis or any subjective theories about pain. After all, the radiologist is not the patient’s doctor and has not taken time to examine them outside of the diagnostic films. It is well studied that radiologists who do speculate on their reports provide a significant nocebo effect and might even influence the prognosis offered by the primary treating physician. If listhesis is diagnosed via x-ray or MRI, it can immediately be graded and classified by type. Magnetic resonance imaging will be able to provide clues on possible mechanisms of pain, if any symptoms are indeed present. Possible causative mechanisms for symptomatic activity that can be identified via MRI include central spinal stenosis, neural foraminal stenosis, mechanical dysfunction, related facet joint pathology, related intervertebral disc pathology, as well as causative or resulting ligamentous abnormalities. MRI results can be taken or sent electronically to multiple doctors, making second opinions easy to achieve. However, patients are cautioned that physical examination should always be an important part of any diagnostic evaluation. It is not sufficient just to send films to a physician and expect a quality diagnostic confirmation. MRI is superior to x-ray medical imaging, since it can produce a wider range of accurate images, from multiple perspectives. MRI can also image all the various tissue types in the anatomy, gathering far more information about possible pain complaints in the process. MRI imaging does not entail the same degree of risk from radiation as x-rays does, especially after related exposure, such as that endured by many listhesis patients. On the downside, MRI is time-consuming. X-rays provide immediate images, while MRI takes a substantial time frame to complete. Some patients find the experience of undergoing MRI to be physically difficult, having to hold a static and possible uncomfortable position for upwards of 45 minutes, as well as fear-inducing if they despise confined spaces and loud noises. MRI is not always available, since the technology is large scale and mostly not portable (unless housed in dedicated trailers which can be moved to different locations). MRI is also expensive and some insurance plans refuse to grant coverage, unless there is a really good reason for the test to be performed. The biggest weakness of MRI is the same one that haunts all diagnostic tools: The possibility for human error. MRI, like other forms of diagnostic imaging, does not diagnose anything by itself. It merely provides evidence that can be use by a trained physician to make a diagnosis based on facts and subjective opinion. It is this subjectively that often leads to negligent errors and might even be the justification for financial exploitation by opportunistic care providers. Be sure to read our detailed coverage of spondylolisthesis misdiagnosis in order to understand how and why these mistakes occur.